Ski holidays Avoriaz : compare ! Children's paradise! From 350 €/week in an apartment 4 pers. Sorry but we don't have any offers available that match all of your criteria..We suggest you to modify your search.. However, here is a list of results partially matching your search. We offer you the possibility to compare some apartments in Avoriaz in order to find the cheapest deal for a ski holiday in Avoriaz. With a modern but aerial architecture, you will enjoy during your ski holidays in Avoriaz a pedestrian and family resort, where you will share with your children many activities. As part of the Portes du Soleil ski area, Avoriaz offers all the pleasures of skiing and snowboarding. You will simply spend a great ski holiday in Avoriaz! 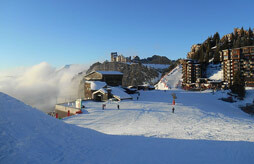 Avoriaz enjoys a surprising architecture, modern and nevertheless well integrated into the mountain landscape. You can enjoy the terraces to admire the timeless architecture of the resort or benefit from its sublime sunshine. You will find all shops in the center of the resort of Avoriaz, restaurants for all tastes and budgets, as well as wine bars or pubs to relax. The resort also has a superb covered aquatic area where you can bathe or have fun, all in a tropical jungle setting. Among other leisure facilities, go to the skating rink or snowpark during your week in ski hire in Avoriaz. The ski resort gives you access to a breathtaking and wide-ranging ski area, the Portes du Soleil, where you can even reach Switzerland thanks to the network of slopes and lifts. This fantastic ski area offers slopes for all levels, with links to neighboring ski resorts: the opportunity to discover some villages or to marvel at new panoramas. Compare ski holiday rentals in Avoriaz and use Ski Express to reserve skiing in Avoriaz and discover beautiful scenery, a lively resort, and exciting activities. In Pierre et Vacances residences or in apartments of the professionals, find your accommodation by comparing the offers. These ski rentals are available from holiday sites, and they can benefit from one-off discounts or last-minute promotions. We also offer offers for a ski rental with integrated spa near the Massif du Chablais if you are in love with the beautiful landscapes and wish to spend a relaxing holiday at the same time.